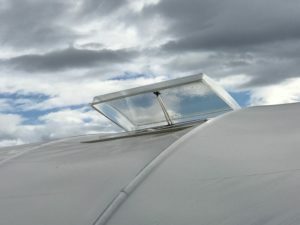 Roof vents are a valuable accessory to your greenhouse. They will allow the hot air in your greenhouse to be ventilated naturally without any electricity. 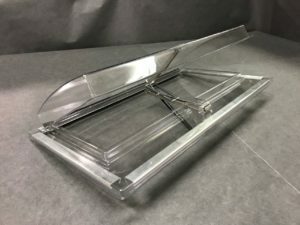 These roof vents come with a solar powered automatic opener that can be set to open between 65 to 75 degrees F.
Warm air will rise and exit through these openings. These are constructed of aluminum and a UV protected polycarbonate. They only weigh 8.5 pounds and are easily installed. They can be installed directly into the film coverings of polyfilm greenhouses using the pre-installed base channel and a wiggle wire (included). These vents are 36.5″ x 20.5″ x 4″ with an interior opening of 30.5″ x 12″. This is a great addition to a homemade greenhouse or certain greenhouse kits.